This is from Lloyd Hamilton. 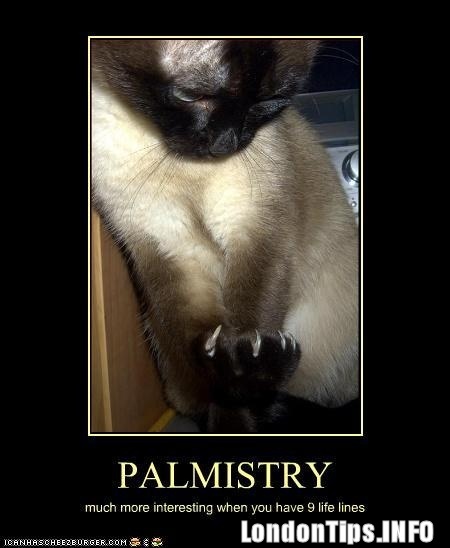 A lot of palmistry is very serious. It is nice to remember there can be a lighter side. My class breaks up for Christmas next week and we usually have a party for the ocassion. I would like to circulate some palmistry jokes but I do not really know any. I have some amusing stories though. Hey Sari,,,,,followed your instructions and got to your webpage....ahem and when I scrolled to the bottom i saw he payment options ....was that the humour in palmistry you wanted to show??? :- kidding......nice page and one of these days when my hat collects the 80 dollar thingie (go for max is my motto!!!) at the local parish I will knock at yer door. Maybe you kin tell me if I have a car tree on me palm or is fate just gonna do a cartwheel on me!!! Thanks once again for the calmer-palmer side of your hand!!! I had to go look! I love the last hand too! A journey of the heart in the garden of life!! sunjayakolkar wrote: Hey Sari,,,,,followed your instructions and got to your webpage....ahem and when I scrolled to the bottom i saw he payment options ....was that the humour in palmistry you wanted to show??? :- kidding......nice page and one of these days when my hat collects the 80 dollar thingie (go for max is my motto!!!) at the local parish I will knock at yer door. Maybe you kin tell me if I have a car tree on me palm or is fate just gonna do a cartwheel on me!!! Thanks once again for the calmer-palmer side of your hand!!! I now have some material for my class break-up party. Sari: I loved the funny hand and will use it. I am now thinking of some other pictures that could go on a hand. I would have had the car going up the heart line instead of down. The tree of life looks appropriate. I am still working on a hand for Santa Claus (see later). Roosi: I had a bit of trouble getting the jokes, not the funny side but they kept slipping off the computer, but I managed to copy them and could then read them. I really liked the palm reader knowing his friend was in throuble because he saw it in the headlines. The cat will be useful too. He looks a bit worried. Maybe he could not find 9 lives. Palm reading for picking up girls is interesting. Of course, I would not do such a thing! However, on a plane trip from Brisbane to Sydney I read the palm of the interesting lady beside me. That was fine until I noticed her health line was awful. I gently enquired if she had any tummy troubles. Then I got a broadside on her colon operation and all the ghastly details. I could not have any refreshments when they arrived and it was not air-sick that I felt. It is interesting reading palms of girl-friends at my sons' parties. The reluctant ones wait until they have watched the others and then get some extra courage with more alcohol. They always treat me with respect when I meet them when they are sober. My partner, Kaye, claimed that I am only interested in reading ladies hands so I can get closer to them. I protested that I read men's hands too. She said yes I have timed you. You take half an hour or more with a lady, depending on the fascination, but only 10 minutes with a man. I think she was being a bit tough. It was interesting to see the story by Oscar Wilde. He used to visit Mrs A. Robinson for palm readings. She had a great reputation and her book "The Graven Palm" is a text book of our Guild. She advised Wilde to fight his last court case which he lost. Wilde apparently commented "Alas dear Sybil..."
I will ask he class to interpret this hand and suggest who it might be. I am about to draw it up but you might have some corrections or additions. I would appreciate suggestions. He is a people person so has loop finger prints. He is a bit of a risk taker so has the Jupiter tri-radius displaced outward. He is affectionate and romantic so has a large curved heart line. He appreciates the arts so has a well developed Apollo finger - this might also indicate a risk-taker - riding his sleigh too fast on Christmas eve, perhaps. He should have a great Fate line with a career that is famous. Also it should merge with the Heart line to show he loves his work. His charisma would show with a Raja's loop and an extra line on the second phalange of the thumb. Charm and discernment might show with some of the finger prints being peacock eyes, particularly on the ring finger where it might avert accidents. He has a cheerful outlook so has a loop of humour. He tends to drive himself a bit so the axial tri-radius will be slightly elevated. His craftmanship would be shown by square fingers, particularly on the thumb but his innovative and active qualities would be shown to some spatulate finger tips. His creativity would show in a curved head line. He would have an Earth hand with square palm and slightly short fingers ( how about an Air hand?). He is emotionally stable and practically skillful and energetic and dependable. Enterprise and authority would show in a large thumb, with a wedge shaped tip to show his diplomacy. His high energy level would be shown by a large life line and a big mount of Venus. His extroversion would be shown by a high set Aplollo tri-radius and by gaps between the fingers. His Apollo line would be large and strong showing happiness in his business and creativity. He is focussed so there are relatively few lines in the hand. He has great loyalty to his group so there is a strong line at right angles to the top of the family ring. Samaritan lines show he loves helping people and he must have a mass of children's lines. His psychological insight is shown by a ring of Solomon. His self confidence is shown by a wide open thumb and a large index finger. His responcibilities are shown by a long Saturn finger. This gives me a problem. How can he have short fingers and long Apollo, Saturn and Jupiter fingers? Maybe you can help here. Thank you again I did not know that. It is good to know the background stories. Your Santa Claus like flesh and bone. I applaud your professionalism, enthusiasm, good will and humor ! About Santa Claus fingers, I think it's like age old dilemma - how can Santa be at two places at one time?